Ta-Da. 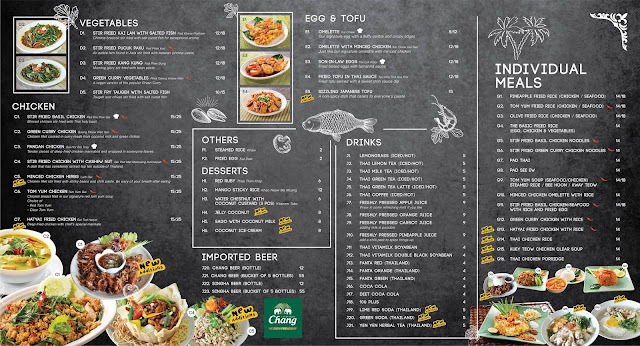 Thai Thai Thai and Thai Foods again, Once again and again Eddy Rush Fatboy went to thai food around Dataran Sunway area and the Shop name is "Eat Drink Thai Restaurant". This brand name surely is well known by Thai foods lover in Klang valley, It's start operated to public since more than one years till today. Today I'm here to taste out Eat Drink Thai Restaurant Signature Red Tom Yum Seafood Pot and Thai style Steamboat that take customers on a culinary adventure around, While maintaining its reputation for offering comfort food, as it drives to elevate the comfort food proposition on which the brand has been built. The beautiful industrialist yet homey feeling whenever you enter and it will give you a sense of what is really all about foods, chill and relax. The feeling will make you stay here even longer and it would also make for a good place for a bottle of Chang beer or just enjoy a great meal. The atmosphere is serene and cozy that looks like your are at Thailand. Served with a clay pot filled with broth. When the broth is boiling, then first add the vegetables. This will lower the temperature in the pot a little and you should wait until it boils again before putting a piece of meat in the pot using chopstick and cook the meat for just less than one minute or until it’s cooked, then enjoy the meat by dipping it into the sauce. Two soup base to choose, Clear and Tom yam Soup. Pandan chicken is one of the more popular dishes in Thai cuisine, boneless chicken special marinated , wrapped thinly with screwpine leaf and deep fried to perfection. This brings out the aroma and maintains a balance of crispiness and tenderness that leaves you wanting for more. Green Curry Chicken, This Thai green curry chicken features chunks of tender chicken simmered in a green curry sauce. Thai green curry that is very aromatic and beautiful to serve especially along with Rice. Hatyai Fried Chicken, Southern Style Fried Chicken Thai food is probably better known as my Hatyai inspired Thai style deep fried chicken. 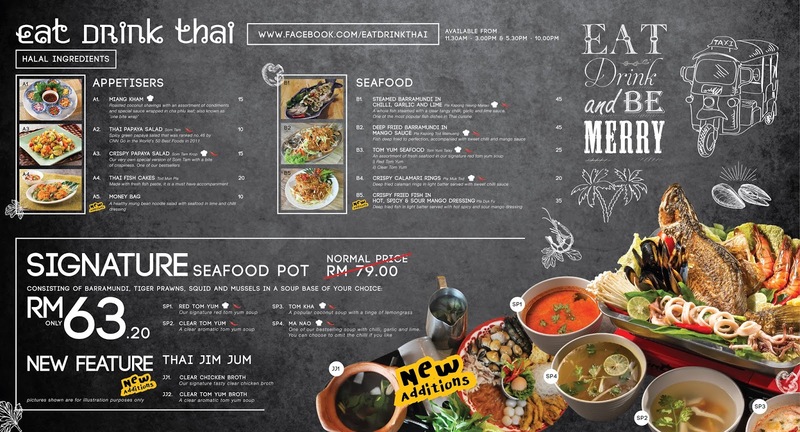 This is one Thai food that you cannot miss eating when you are at Eat Drink Thai. Olive Fried Rice Chicken, This fried rice recipe has a different twist from more others fried rice because of the flavor of the olives. This olive fried rice is not so common that you would find it in any restaurants. Pineapple Fried Rice, pineapple fried rice is a lovely blend of sweet and savory flavors. With the addition of fresh pineapple, flavored with shrimp paste and fish sauce, pineapple fried rice is the only fried rice I really wanted to eat. Not only does it look visually appealing, the taste of pineapple fried rice is simply mouthwatering and utterly appetizing. Thai Milk Tea & Thai Green Milk Tea, Cha Yen (ชาเย็น), or known throughout the world simply as Thai iced tea. The creamy style of Thai iced tea that most Thai restaurants in Malaysia serve, and this unique blend of soothing green tea notes with creamy milk touches won’t disappoint. An absolute must-try!